his spring, for the first time, new members of the Swarthmore Alumni Council will be approved as a slate rather than elected as individuals. As reported in the July 2008 Bulletin, the Council ratified the new selection method at its spring 2008 meeting. Last fall, the Council nominating committee reviewed candidates for 14 upcoming vacancies and chose a set of candidates and alternates. The final candidates agreed to serve 3-year terms, after which the slate was approved by the nominating committee and ratified by the full Council. The Council now asks alumni to ratify this slate of candidates by Friday, May 22. Alumni may do this by either returning the postcard inserted on p. 47 of the magazine or by going online to www.swarthmore.edu/council.xml. This Web site has full profiles of each of the candidates on the slate. 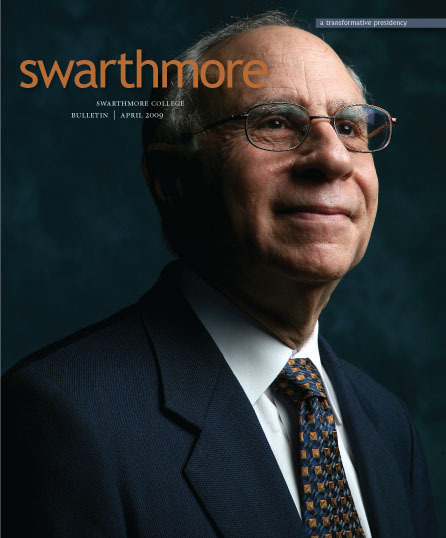 To complete the process online, alumni will need to log into the Swarthmore Online Community. Those who are not yet registered will need their Swarthmore ID number, located above their name on the mailing label of this magazine. Alumni are also encouraged to suggest candidates for consideration on next year’s slate. In selecting new members, the nominating committee considers factors such as geographic location, class year, a demonstrated interest in the College through volunteer service, participation in College-sponsored activities, and a consistent record of giving as well as volunteer participation in other organizations. Alumni may nominate a candidate (including themselves) on the postcard, online, or at any time by e-mailing alumni@swarthmore.edu. Nominations received by Oct. 1 of a given year will be considered for the following year’s slate. Zone C: Conn., Maine, Mass., N.H., R.I., Vt. Zone D: D.C., Md., Va. Zone E: Ill., Ind., Iowa, Kan., Mich., Minn., Mo., Neb., N.D., Ohio, Okla., S.D., Texas, W.Va., Wis. Zone G: Alaska, Ariz., Calif., Colo., Hawaii, Idaho, Mont., Nev., N.M., Ore., Utah, Wash., Wyo.